We love these amazing roasted olives. Whenever we have a group visiting for any reason, these Roasted Olives are always something we prepare for everyone’s enjoyment. They are super easy and make a real splash when entertaining. I found the original recipe online from Lindsay Olives a very long time ago. Over time, this has morphed into the recipe I use today. 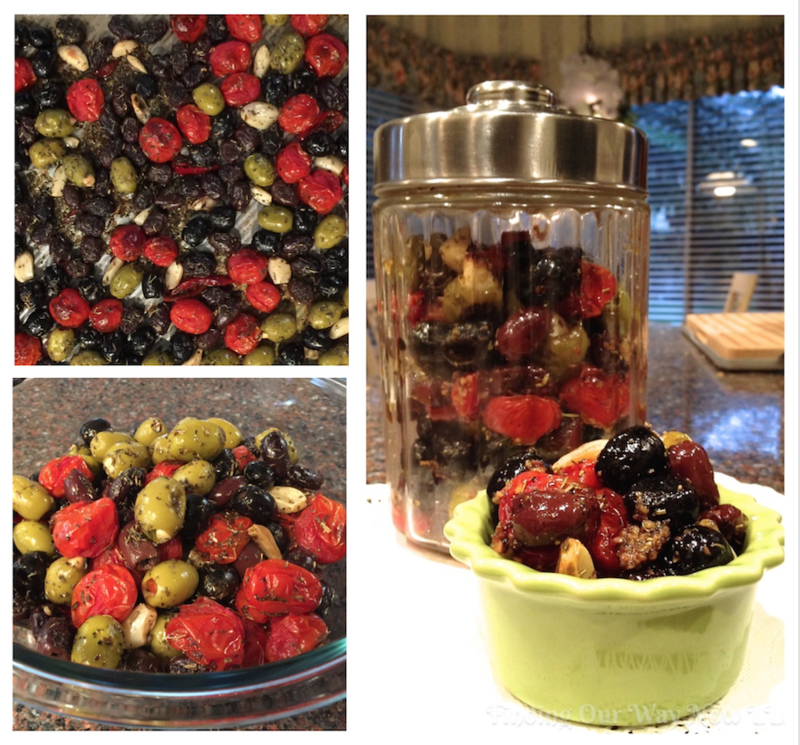 I first made these roasted olives a few years ago for a group of people who were visiting our home. They were a huge hit. 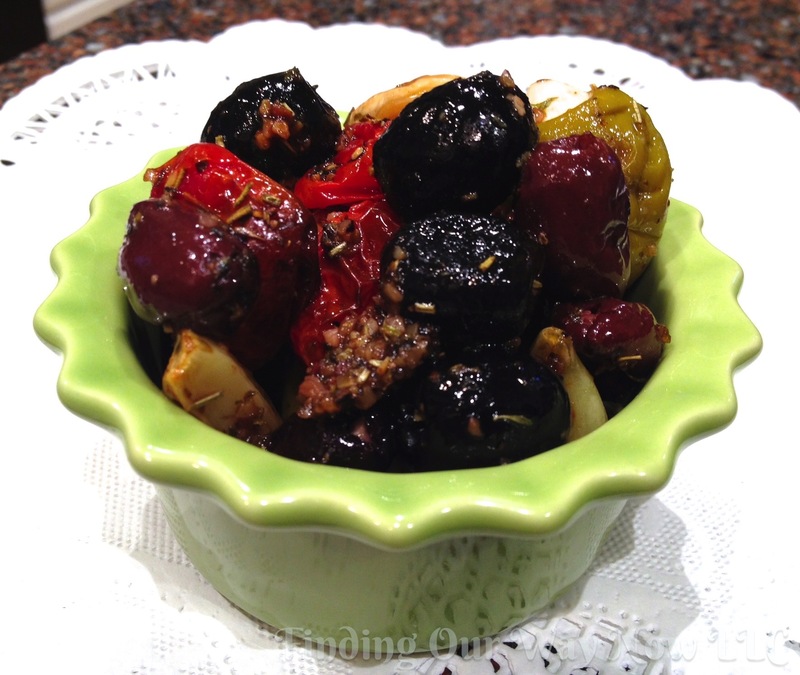 What I like about these roasted olives is they are no-fail, the flavors are to die for and you can make them well ahead of time. Preheat the oven to 425°F. Combine all ingredients in a large bowl; mix until coated with oil and herbs. Pour the mixture onto a baking sheet and evenly distribute in a single layer. Bake 20 minutes or until the tomatoes have shriveled and are slightly browned. Allow to cool on the sheet pan. 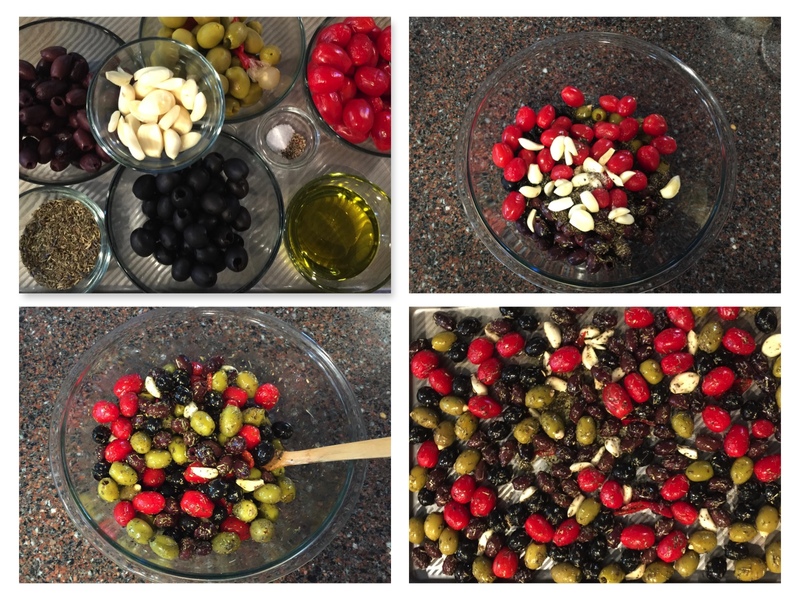 Carefully transfer the olive mixture to a serving bowl or put them in a glass container to refrigerate for a later time. Notes: To make this recipe easier, I’ll buy my garlic already peeled to save time. If you refrigerate the olives, bring them to room temperature before serving. These olives can be warmed in the oven in a serving dish or the microwave for around 30 seconds on medium power. I do prefer to serve them warm from the oven. I usually serve these olives with toasted baguette slices and a cheese board with a block of Parmesan cheese or good smoked Gouda to allow our guests to shave off pieces to eat with the olives. These Roasted Olives are a no-fail, super easy appetizer that everyone will enjoy. These olives go especially well with a nice Zinfandel wine. Now, when you’re in a pinch and don’t know what to make for visiting guests, give this a try. 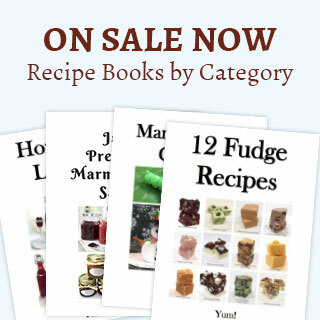 Just one warning, make sure to make a big batch and have a few printed recipes on hand. You will need both.